The ranch can accommodate families/ friends up to 8 guests (in beds) for reunions and get-togethers. Inquire with the owner for breakfast and cookout options for your group. Walnut Hollow Ranch is the first business in Clay County to receive recognition from the NC Department of Environmental Quality. The NC Green Travel Program recognizes businesses in the travel industry that have established and adhere to a set of guidelines that protect the environment. Walnut Hollow Ranch is dedicated to providing high-quality all natural - grass fed beef. Our Black Angus Cattle are raised responsibly, with top standards, producing the finest beef obtainable. We are committed to offering a healthy beef choice direct to your family. Walnut Hollow Ranch Premium Black Angus Beef is produced without hormones or antibiotics. The ranch is certified by Animal Welfare Approved caring for the health and well-being of the cattle using the highest animal welfare standards. Our grass fed beef is low in saturated fat and higher in Omega3 fatty acids. Our progressive breeding ensures a tender, high quality beef product. The result is the finest beef you’ll ever put on your plate. In addition, you’ll see many conservation practices used to protect the farm’s resources, water quality and environment. Walnut Hollow Ranch was bestowed the 2014 Area 1 Conservation Farm Family of the year award. A different kind of hostel....agritourism rocks! The hostel at this cattle ranch is a great place to relax and unwind! The room was nicely appointed, clean and very comfortable with beds, kitchen table and sofa seating area! Outside, there are umbrella’ed picnic tables on a patio that overlooks a lush green field of cows ... no cow smell either! You have access to the ranch kitchen and grills for cooking meals should you choose, but great dining is close by should you choose not! Charlie is an excellent host! His beautiful ranch has horses and goats as well as the cattle...it has a spring fed fishing pond that one can swim in too. Hiking trails lead up to view the ranch and the surrounding mountains! You can purchase Charlie’s humanely raised meats in his onsite shoppe. This is by no means a glam ranch, but a highly comfortable working ranch and we enjoyed visiting with other agritourism visitors who arrived in self contained campers from near and far! The only inconvenience was the shared all in one bathroom...there is not an alternate toilet for guests to use when another guest is showering, but it is a hostel so this was expected. Looking forward to a return visit! Thank you for comments. 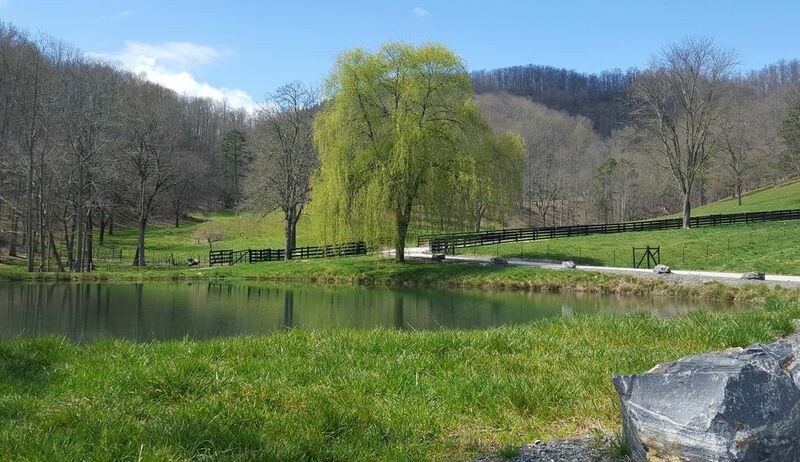 I encourage visitors coming to Clay County, Hayesville NC to visit our website walnuthollowranch.com for 'Things To Do' and explore the mountain lifestyle. We enjoyed our stay! Charlie was very kind and welcomed us when we arrived. The room and common areas were clean and comfortable. We will be back again!